#27. 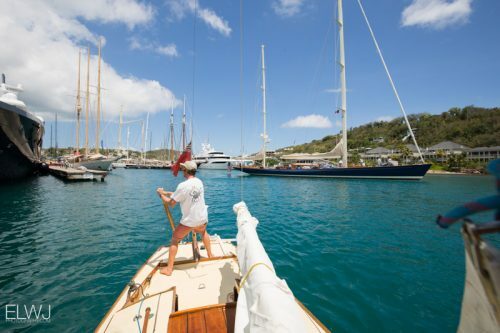 Antigua Classics, and Northwards… – Sampson Boat Co. 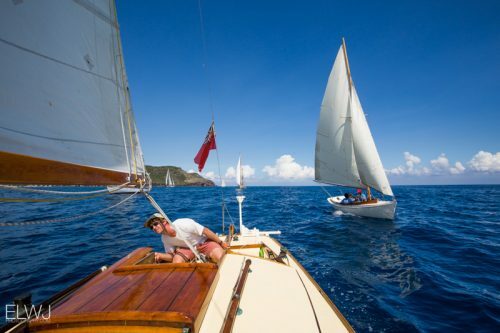 In 2015, I entered my 25’ Nordic Folkboat Lorema into the Antigua Classics. I had recently sailed her from the UK, and we were very well received, being notable as the smallest boat in the fleet. 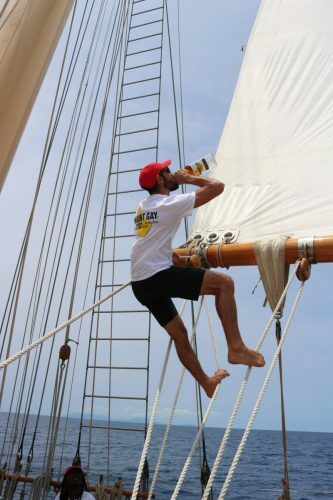 This time around, one year later, I was sailing on the largest boat in the fleet – the three-masted Schooner Adix. 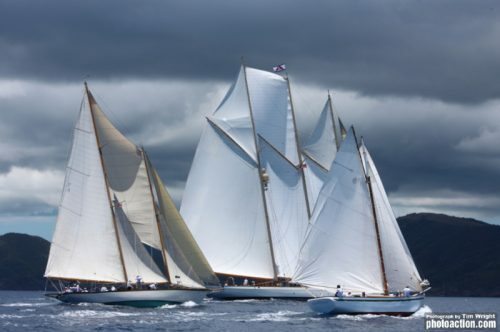 However, Lorema was still in Antigua, moored alongside Adix, and so I hatched a plot to sail her in the first event of the regatta – the single-handed race. When the day came around, the winds were very light and flukey. 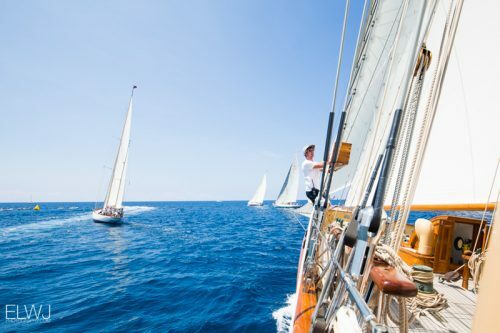 Although described as singlehanded, you are required to have one other person on board for this race, in the interest of safety. 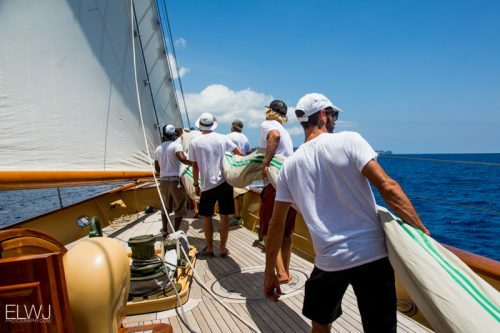 I found this slightly ironic, considering the thousands of miles of singlehanded offshore sailing that Lorema has seen, but I didn’t complain, especially when the lovely Emma from ELWJ photography volunteered to come and take photos on board. I did some last minute painting on the morning of the race. I sculled out of our berth, hoisted sail, and we headed out towards the line. Halfway there, I remembered the paint, and had to lean over the side to pull the blue tape off the hull. There were only a few knots of breeze on the start line, but the sun was shining, and we slipped through quietly, with a beer in hand. 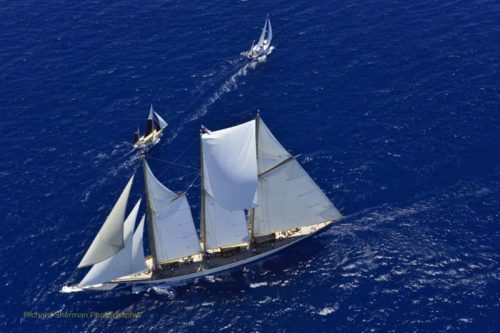 Lorema was caught in the wind shadow, and when we neared the first mark we were about halfway back through the fleet. However, the little folkboat is extremely maneuverable, and coming around the mark I managed to sneak through a small gap, squeezing between the sloop Paloma and the red bouy with inches to spare. Suddenly, we were in third position. 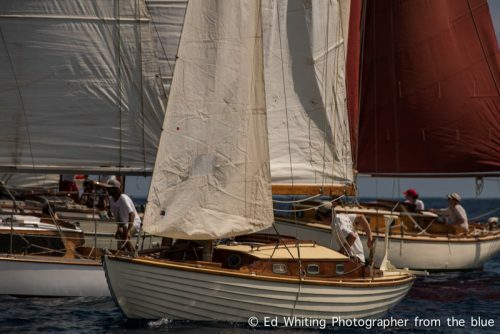 Just ahead of us was a small Herreshoff dinghy, crewed by a couple of local lads. 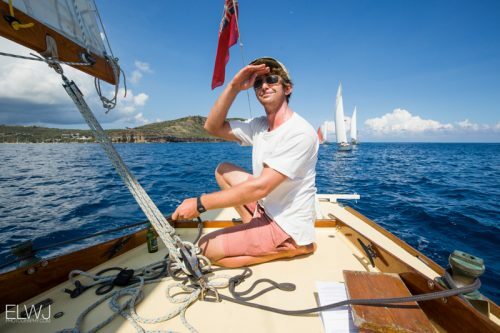 As we inched past them, I saw them glancing longingly at our cold beers, and so I luffed up a little, and sailed close enough for Emma to pass them a couple of cans from our cooler. 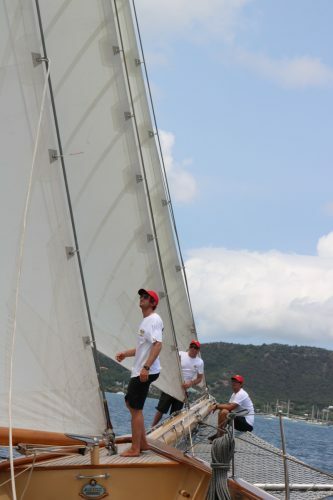 As we continued around the course the wind picked up very slightly and we were caught up by some of the larger yachts. I did my best to luff them and prevent them from getting past, but couldn’t stop them all. Nevertheless, Lorema won first overall in that race, partly thanks to the leading boat starting over a minute early over the line, and receiving a five-minute penalty as a result. Emma later uploaded an excellent video with clips from the singlehanded race, and from the deck of Adix. Embarrassingly, she included a shot of me “doing my hair” in irony – unaware that she was actually recording! 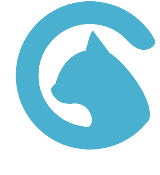 Watch the video here…. My job was to run the deck and the sail changes, based on the information received from the tactician and the Captain. There were twenty people to sub-divide and organise, and after the chaos of the first day, I assigned everybody very specific positions at the beginning of the second race. This helped a lot, and as people learned their jobs, the boat started running like a well-oiled machine. 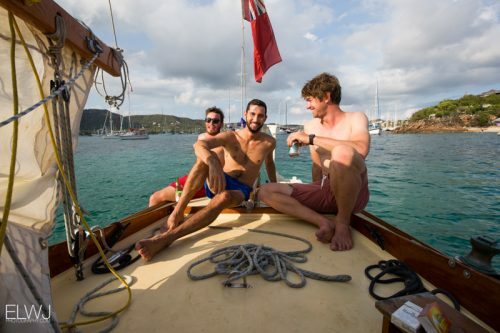 Unfortunately, this is usually the case – by the last day of any regatta, the crew tend to have just figured out what they are supposed to be doing – then everybody goes partying for a week and forgets it again. On the third day, we took line honours, but Alexa of London won on corrected time. We won again on the fourth day, meaning 1st place overall. On the final rainy day, I raced Lorema against some small dinghies in the sculling competition, and lost wholeheartedly. My old girl was a bit heavier than her competition, but I didn’t let her get upset about it. I took an young lad on board who had decided that he would like to buy a folkboat himself one day. He was part of the wonderful family who cruise on their Wylo II, Island Swift. I have bumped into them in various places around the world, and they have inspired me every time with their musical, acrobatic shenanigans, and their great outlook on life. Read their blog here. After a bit more preparation, we waved goodbye to the Caribbean and set sail north, via a quick stop in St.Martin (for the sake of a container) towards the USA. We charted a straight course towards Bermuda. The infamous triangle didn’t worry us too much, but the drop in temperature and the increase in cloud cover certainly caused some anxiety amongst the crew. 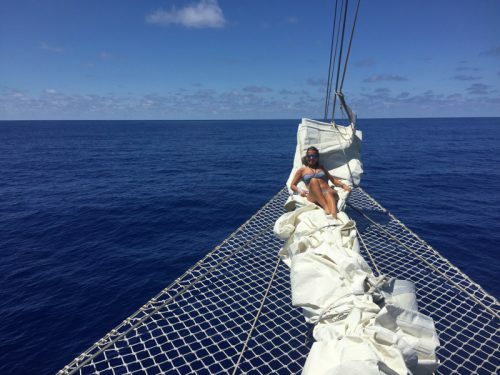 When the sun shone we made the most of it, lounging around on the bowsprit net as the helmsman kept our heading true and clocked off the miles. One night we sailed through an intense electrical storm, and the rain came down so hard that the whole deck was awash. The weather system followed us for hours, until finally we had to gybe away at a right angle to get out of it. 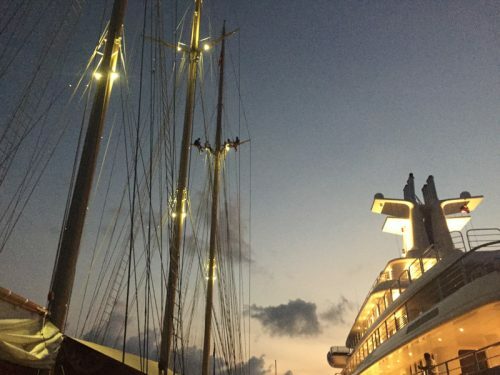 When the skies eventually cleared there was a beautiful full moon behind them, and I climbed the rigging to sit on the spreaders and gawp at it. 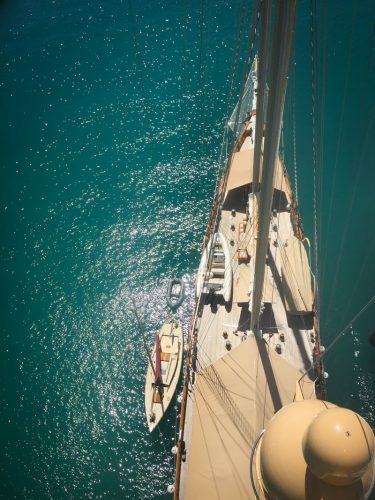 From that height, you can hear the creaking of lines and blocks in the rig as the sails draw, and the distant crashing of the bow through the waves, far below, but nothing else. 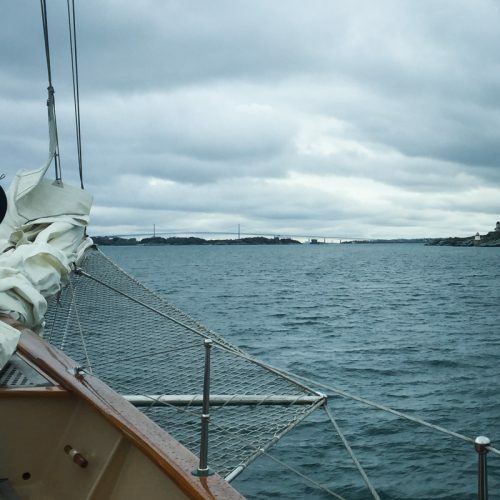 You feel the movement of the boat through the exaggerated leverage of the mast, and see the unbroken horizon all around. It’s quite magical. The forecast was good, so we went straight past Bermuda and continued north. 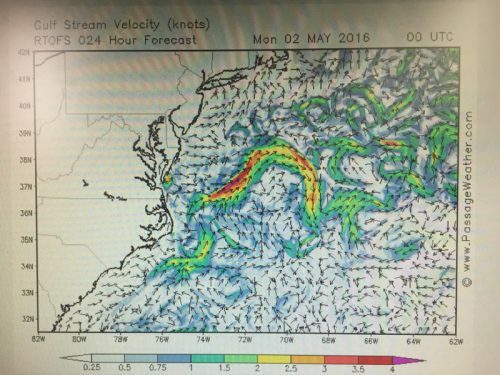 We adjusted our course to take advantage of the gulf stream current, which runs at up to six knots in a roundabout, swirling path, from south-west to north-east. As we went though it and came out the other side, the air temperature dropped quickly from 25 to 8, and the water temperature from 25 to 14… Suddenly, we all regretted throwing away our winter clothes in the Caribbean, and had to fight over a handful of wooly jumpers and socks. 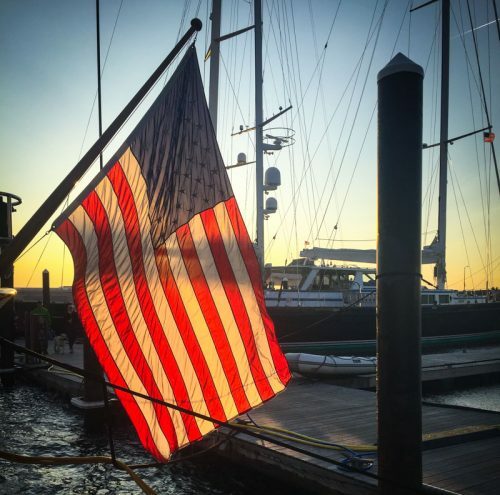 Six days later, we arrived in Newport, Rhode Island. We saw the famous mansions on the coastline as we came in, and the temperate green scenery looked bizarre after several months in the Caribbean. We moored, and celebrated – we had landed in the land of opportunity! – The land of the free! – God’s own country! -New England, no less! What fortunes would it bring?